Cesc Fabregas came off the bench to fire 10-man Arsenal into the FA Cup fifth round as the Gunners narrowly saw off League One Huddersfield. The hosts led when Peter Clarke diverted Nicklas Bendtner's strike into his own net, before Sebastien Squillaci was sent off for a block on Jack Hunt. The red card changed the game and Alan Lee headed the Terriers level. 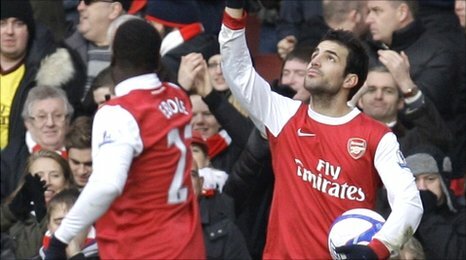 But Fabregas slotted home a late winner from the penalty spot after Bendtner had been fouled by Jamie McCombe. There was a tangible sense of relief at full-time at the Emirates after Fabregas, not for the first time, provided the spark that rescued the north Londoners from a tight spot. After dominating the first 40 minutes of the match, Arsenal found themselves on the back foot following Squillaci's deserved dismissal and an equaliser from Lee - the 32-year-old striker's first goal for Huddersfield on his 26th appearance for the club. Fabregas' decisive spot-kick, four minutes from time, was a cruel end for the Terriers, who rattled the Gunners with an outstanding second-half display. The game's riveting culmination looked unlikely at the start, as the seemingly overawed visitors defended deep and allowed the home side to come forward, with Andrey Arshavin blazing over a good chance after only two minutes. The Russian, sometimes out of sorts in recent weeks, was seeing plenty of the ball on the left-hand side up against Hunt, a 20-year-old right-back making his first Huddersfield start. Arshavin skinned the youngster at the first opportunity and crossed for Bendtner, who could not direct his close-range effort on target. Arshavin then fired weakly at Huddersfield goalkeeper Ian Bennett from a good position, before cutting inside Hunt and shooting against the outside of the post. A comical Bendtner air-shot then brought ironic cheers from the 5,000 Huddersfield fans massed behind the Clock End goal, before the Dane was involved in a fortuitous Gunners' opening goal. Latching on to a pass from Marouane Chamakh, who appeared to control the ball with his arm in the build-up, Bendtner raced clear and fired off target, only for his shot to get a helpful diversion off the sliding Clarke and into the far corner. Arsene Wenger's men continued to look largely untroubled, with the visitors' best chance falling to the dangerous Anthony Pilkington, who miscued a header from Joey Gudjonnson's cross. The first glitch in Arsenal's relaxed afternoon occurred when key midfielder Samir Nasri pulled up with a hamstring injury and was replaced. The Terriers then found a way back into the game from the unlikely source of right-back Hunt. The young defender dispossessed Arshavin for the first time in the game and set on a rampaging run through the Gunners' midfield, which ended when he was blatantly body-checked by last man Squillaci, who was duly sent off. The red card gave the second half a totally different complexion, with Huddersfield coming out of their shell and pressing for an equaliser. Gudjonsson was at the heart of the visitors' best moves and his dangerous cross was headed inches wide by McCombe. The Terriers went even closer to a leveller when Gunners keeper Manuel Almunia, previously a virtual spectator on his return to the Arsenal side after four months out injured, dived down low to turn Lee's header around the post. But the veteran Huddersfield striker was not to be denied moments later when he crashed a powerful header past Almunia from Pilkington's corner. Wenger, keen to avoid a replay in an already congested season, sent on captain Fabregas as the north Londoners pushed forward, only to be repeatedly thwarted by Clarke. The Terriers defender looked to make amends for his earlier lapse, first with a brave block to deny a dithering Bendtner and then with a superb saving tackle on the Dane, before Fabregas broke the League One side's resistance. The Spain midfielder sent in a pass for Bendtner, who went down under McCombe's challenge, allowing Fabregas to calmly slot past Bennett from the resultant penalty. There was still time for Gary Roberts to send a free-kick just over the bar, while Lee spooned Huddersfield's last chance high into the away fans, whose dreams of beating Arsenal for the first time in 40 years were extinguished. 90:00+3:53 Free kick awarded for an unfair challenge on Francesc Fabregas by Jack Hunt. Francesc Fabregas has an effort direct from the free kick. 90:00+3:53 Booking Jack Hunt receives a yellow card. 90:00+2:21 Booking Francesc Fabregas is given a yellow card. 90:00+0:12 Free kick awarded for a foul by Anthony Pilkington on Laurent Koscielny. Manuel Almunia takes the indirect free kick. 89:27 Peter Clarke gives away a free kick for an unfair challenge on Tomas Rosicky. Francesc Fabregas restarts play with the free kick. 89:00 Effort on goal by Alan Lee from inside the area goes harmlessly over the bar. 88:05 Neves Denilson concedes a free kick for a foul on Scott Arfield. Ian Bennett takes the indirect free kick. 86:39 Joey Gudjonsson fouled by Tomas Rosicky, the ref awards a free kick. Gary Roberts fires a strike on goal direct from the free kick. 85:33 Unfair challenge on Nicklas Bendtner by Jamie McCombe results in a Penalty. Nicklas Bendtner provided the assist for the goal. 85:33 GOAL - Francesc Fabregas:Arsenal 2 - 1 Huddersfield Francesc Fabregas scores a penalty. Arsenal 2-1 Huddersfield. 84:39 Booking Jamie McCombe is cautioned by the ref for unsporting behaviour. 83:48 Free kick awarded for an unfair challenge on Francesc Fabregas by Lee Peltier. Direct free kick taken by Francesc Fabregas. 83:48 Booking Anthony Pilkington goes into the referee's book for unsporting behaviour. 82:30 Laurent Koscielny concedes a free kick for a foul on Alan Lee. Free kick crossed right-footed by Joey Gudjonsson from right channel. 82:16 Centre by Emmanuel Eboue, save made by Ian Bennett. 81:07 Tomas Rosicky takes a shot. Jamie McCombe gets a block in. Outswinging corner taken by Francesc Fabregas from the right by-line, save made by Ian Bennett. 79:19 The offside flag is raised against Peter Clarke. Manuel Almunia restarts play with the free kick. 78:37 Emmanuel Eboue challenges Gary Roberts unfairly and gives away a free kick. Joey Gudjonsson takes the free kick. 76:41 Alan Lee fouled by Kieran Gibbs, the ref awards a free kick. The ball is delivered by Anthony Pilkington, Peter Clarke produces a header from inside the area that goes over the bar. 74:33 Andrey Arshavin takes a shot. Jack Hunt gets a block in. Inswinging corner taken right-footed by Francesc Fabregas from the left by-line, clearance made by Alan Lee. 73:39 Laurent Koscielny concedes a free kick for a foul on Alan Lee. Joey Gudjonsson takes the direct free kick. The referee blows for offside against Gary Roberts. Indirect free kick taken by Manuel Almunia. 72:05 Nicklas Bendtner takes a shot. Blocked by Peter Clarke. 69:49 Tomas Rosicky fouled by Lee Peltier, the ref awards a free kick. Direct free kick taken by Francesc Fabregas. 69:06 Shot by Laurent Koscielny. Jamie McCombe gets a block in. Nicklas Bendtner produces a header from deep inside the six-yard box that clears the bar. 68:54 Francesc Fabregas fouled by Gary Roberts, the ref awards a free kick. Francesc Fabregas takes the free kick. 67:43 Scott Arfield concedes a free kick for a foul on Vassiriki Diaby. Free kick taken by Neves Denilson. 67:43 Substitution Francesc Fabregas is brought on as a substitute for Vassiriki Diaby. 67:43 Booking Caution for Scott Arfield. 65:06 Outswinging corner taken by Anthony Pilkington, assist by Anthony Pilkington. 65:06 GOAL - Alan Lee:Arsenal 1 - 1 Huddersfield Alan Lee scores a headed goal from inside the penalty box. Arsenal 1-1 Huddersfield. 63:44 Shot by Jack Hunt from deep inside the penalty area misses to the right of the goal. 62:56 Free kick awarded for a foul by Peter Clarke on Nicklas Bendtner. Vassiriki Diaby restarts play with the free kick. 61:58 Alan Lee takes a shot. Save by Manuel Almunia. Outswinging corner taken right-footed by Gary Roberts played to the near post, clearance made by Laurent Koscielny. Joey Gudjonsson has shot on goal from just outside the box which goes wide of the right-hand upright. 60:35 Free kick awarded for an unfair challenge on Tomas Rosicky by Joey Gudjonsson. Free kick taken by Alex Song. 59:40 Gary Roberts is caught offside. Free kick taken by Manuel Almunia. 59:40 Substitution Tom Clarke goes off and Scott Arfield comes on. 58:40 Header from close range by Jamie McCombe misses to the right of the goal. 57:51 Gary Roberts decides to take a short corner. Joey Gudjonsson takes a shot. Blocked by Tomas Rosicky. 57:24 Free kick awarded for an unfair challenge on Laurent Koscielny by Alan Lee. Free kick taken by Laurent Koscielny. 56:38 Neves Denilson takes a shot and went wide left of the net. 55:57 Corner taken by Tomas Rosicky. 54:56 Jamie McCombe takes a shot. Save by Manuel Almunia. 53:58 Anthony Pilkington takes a outswinging corner from the right by-line played to the near post, Laurent Koscielny manages to make a clearance. 52:53 Free kick awarded for a foul by Joey Gudjonsson on Vassiriki Diaby. Vassiriki Diaby takes the free kick. 51:23 Lee Peltier concedes a free kick for a foul on Tomas Rosicky. The free kick is swung in right-footed by Andrey Arshavin, Ian Bennett makes a save. 49:34 Joey Gudjonsson takes a shot. Save by Manuel Almunia. 46:16 Close range effort by Andrey Arshavin goes wide of the left-hand upright. 45:01 Substitution Alex Song on for Marouane Chamakh. 45:00+2:16 The players leave the pitch at half time. 45:00+1:30 Shot from 20 yards from Jack Hunt. Blocked by Kieran Gibbs. 45:00+0:50 Free kick awarded for a foul by Neves Denilson on Tom Clarke. Free kick taken by Joey Gudjonsson. 41:57 Sebastien Squillaci gives away a free kick for an unfair challenge on Jack Hunt. Direct effort from the free kick comes in from Anthony Pilkington. 41:57 Sent off The referee shows Sebastien Squillaci a red card. 39:26 Alan Lee fouled by Sebastien Squillaci, the ref awards a free kick. Direct effort from the free kick comes in from Joey Gudjonsson. 38:47 Headed effort from inside the area by Anthony Pilkington misses to the left of the target. 35:36 A cross is delivered by Andrey Arshavin. 32:08 Substitution Tomas Rosicky joins the action as a substitute, replacing Samir Nasri. 30:09 Free kick awarded for a foul by Kieran Gibbs on Anthony Pilkington. The free kick is delivered right-footed by Gary Roberts from right wing, Manuel Almunia makes a save. 29:43 Effort on goal by Nicklas Bendtner from 12 yards. Save by Ian Bennett. 27:26 Anthony Pilkington has an effort from just inside the box that misses to the left of the goal. 26:29 Alan Lee fouled by Laurent Koscielny, the ref awards a free kick. Direct free kick taken by Peter Clarke. 26:29 Booking Kieran Gibbs booked for unsporting behaviour. 24:58 Alan Lee is flagged offside by the assistant referee. Indirect free kick taken by Kieran Gibbs. 21:12 Nicklas Bendtner provided the assist for the goal. Nicklas Bendtner takes a shot. Blocked by Peter Clarke. 21:12 GOAL - Peter Clarke:Arsenal 1 - 0 Huddersfield Peter Clarke puts the ball into his own goal. Arsenal 1-0 Huddersfield. 15:56 Anthony Pilkington delivers the ball, Jamie McCombe has a headed effort at goal from close range which goes wide of the left-hand post. 15:13 Outswinging corner taken left-footed by Gary Roberts played to the near post, Marouane Chamakh makes a clearance. 14:01 Andrey Arshavin produces a right-footed shot from inside the six-yard box and hits the post. 12:50 Shot by Andrey Arshavin. Save made by Ian Bennett. 11:04 Nicklas Bendtner produces a right-footed shot from deep inside the six-yard box which goes wide of the left-hand post. 10:14 The ball is crossed by Kieran Gibbs. 5:47 Jamie McCombe is flagged offside by the assistant referee. Manuel Almunia takes the free kick. 4:53 Gary Roberts fouled by Emmanuel Eboue, the ref awards a free kick. Gary Roberts restarts play with the free kick. 2:45 Effort on goal by Andrey Arshavin from deep inside the area goes harmlessly over the bar. 1:51 Nicklas Bendtner takes a shot. Blocked by Peter Clarke. 0:19 Laurent Koscielny fouled by Alan Lee, the ref awards a free kick. Indirect free kick taken by Manuel Almunia.